President Trump finally revealed what he thinks a better trade deal looks like. And it could be good for Amazon. The Trump administration this week published a list of goals for the upcoming renegotiation of NAFTA, the free trade agreement between the United States, Canada and Mexico. There are no guarantees, but experts say Trump's trade vision could boost e-commerce sites like Amazon (AMZN) and eBay (EBAY) -- helping create American jobs and closing the trade deficit with Mexico. Those same experts, however, point out that Trump's objectives on e-commerce look a lot like the ones included in the Obama administration's Trans Pacific Partnership, a trade deal Trump not only withdrew from, but slammed as a terrible for American workers and businesses. "Add that to your list of contradictions when it comes to the administration's trade policy," says Joshua Meltzer, a trade expert at the Brookings Institution. "It's an incoherent approach to trade." Yet another contradiction: Trump's policy could substantially help Amazon. CEO Jeff Bezos owns The Washington Post, whose coverage of the administration Trump has criticized. Trump also has accused Bezos and Amazon of monopolistic practices, and said the company should be taxed more heavily. "I have respect for Jeff Bezos, but he bought The Washington Post to have political influence," Trump said. "He owns Amazon. He wants political influence so Amazon will benefit from it. That's not right. And believe me, if I become president, oh, do they have problems. They're going to have such problems," Trump said in February. The NAFTA goals put forward by the White House would raise the threshold for when a duty, or tax, is required of foreign shoppers. Such a change would ostensibly be a boon for online retailers in the U.S.
Amazon and eBay didn't respond to requests for comment. Here's how it works now: Mexican shoppers pay a duty if they buy more than $50 of goods from online platforms or from U.S. retailers. Canadians only have to spend about $16 on U.S. goods before incurring a tax on their purchases. The shoppers pay the tax to their home country -- Canada or Mexico. "These policies represent a severe constraint on the ability of U.S. e-commerce platforms to achieve their full potential in exporting to Mexican and Canadian markets," FedEx Managing Director for Legal, Trade and International Affairs Ralph Carter wrote to Trump's U.S. Trade Representative in June. Trump's trade team says it wants to raise the duty free threshold to $800, which is the same level for Americans buying goods in Mexico or Canada. The idea is to give Mexican and Canadian shoppers a stronger incentive to "Buy American." 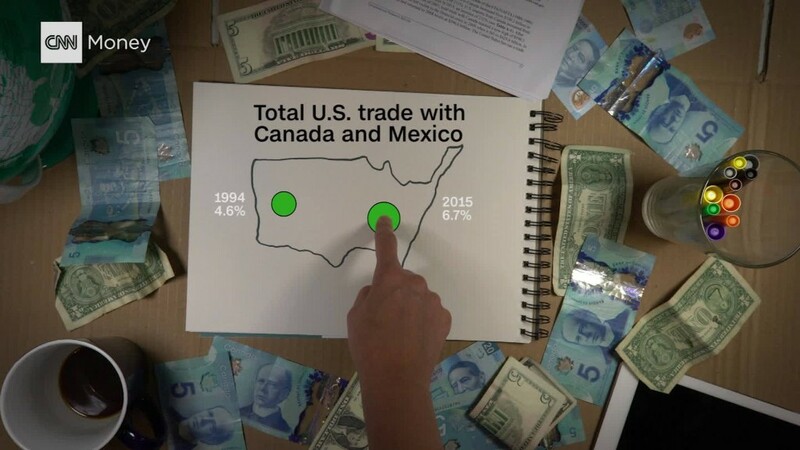 "This, if accepted, would really magnify trade over the internet and shopping across the border," says Gary Clyde Hufbauer, a trade expert at the Peterson Institute for International Economics. Economists say more foreign shopping on U.S. platforms could create American jobs and accomplish one of Trump's biggest goals: reduce the almost $64 billion trade deficit with Mexico. Trump blames the growing deficit for the loss of American manufacturing jobs. Nonpartisan congressional research concluded in 2015 NAFTA didn't cause mass job loss. Still, all players agree that e-commerce needs to be included in NAFTA, which has no provisions on it because the deal was signed in 1994, just before the internet revolution. But the devil is in the details, experts say. "At 40,000 feet, everybody is on the same page," says William Reinsch, a senior fellow at the Stimson Center, a nonprofit in Washington. "[But] it depends on how far you want to take it." Canada, for its part, didn't want to raise the duty-free level when discussing the Trans Pacific Partnership deal with the Obama administration. "Canada had strong objections to that proposal in TPP and at the [World Trade Organization]. They didn't want to make it easy for Canadians to cross the border and buy products, such as milk, cheaper in the United States. They wanted Canadians to 'Buy Canadian,'" says a former senior U.S. trade official. So even though all sides broadly want to include e-commerce in NAFTA, how much each country will budge remains up in the air. The duty free threshold isn't the only step needed. Trump's team wants customs paperwork between the three countries to be more compatible and make it more seamless for companies to fill out documents for import and exports. Other technical measures are needed too, advocates say. Negotiations between the three countries to restructure the deal begin on August 16.